Our Smart Marketing Plan includes having your listing syndicated to high traffic internet sites. 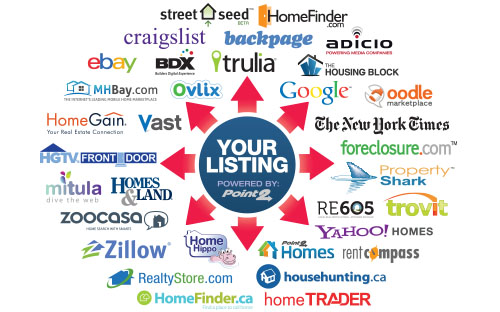 This gives your home ultimate exposure using one of the largest and most secure listing syndication networks in the real estate industry. Most buyers begin their home search on the internet. Once your property is listed, we have the opportunity to syndicate them to over 50 of the highest trafficked search sites on the internet. Our Smart Marketing Plan is customized to fit the needs of each listing, using direct mail marketing (Just Listed/Just Sold Postcards), magazine ads, open houses, virtual tours, website advertisement, syndication, email marketing campaigns, and any other marketing deemed necessary to proceed from "Just Listed" to "Just Sold". Click Here to view some of our advertisement samples. Contact Us for additional information and a detailed Smart Marketing Plan designed specifically for your home.